Regional growth patterns have changed some following the start of the Great Recession. While counties in the South continued to account for the largest share of the nation’s Hispanic population growth (43% between 2007 and 2014, a small decline from 44% between 2000 and 2007), counties in the Northeast – particularly those in New Jersey, New York and Pennsylvania – accounted for a larger share of national Hispanic population growth since 2007 than in 2000-2007 (14% vs. 11%, respectively). 2 There was a small decline for all of the other regions of the U.S. during these periods. 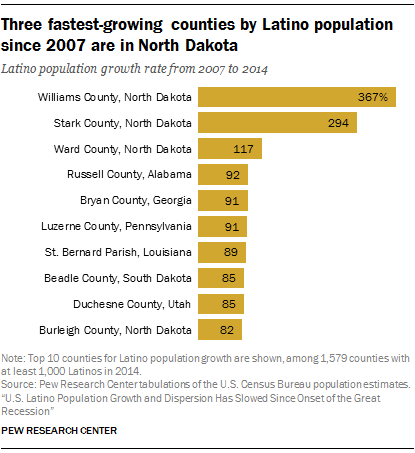 “Fast-growing” counties are those counties where the Hispanic population has grown at a rate above the median growth rate for that time period and had at least 1,000 Hispanics in the latter year. For example, from 2007 to 2014 the median Hispanic growth rate for counties with at least 1,000 Hispanics in 2014 was 26.54%. Counties that had growth rates of more than 26.54% and had more than 1,000 Hispanics in 2014 are considered to be fast-growing counties in this time period. “Slow-growing” counties are counties with Hispanic growth rates that fall at or below the median growth rate and had at least 1,000 Hispanics in the latter year. 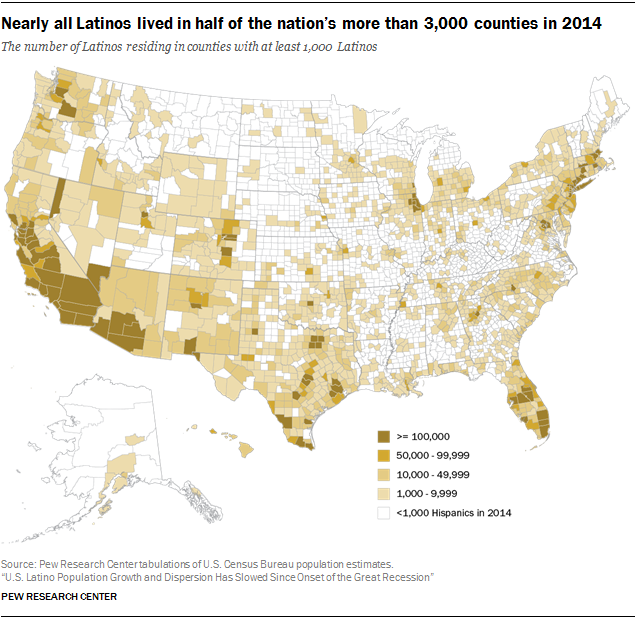 “Negative-growth” counties are those counties where the Hispanic population declined, but still had at least 1,000 Hispanics in the latter year. Northeast, Midwest, South and West refer to census regions that divide the United States into groups for analyses. The Northeast region is comprised of Connecticut, Maine, Massachusetts, New Hampshire, New Jersey, New York, Rhode Island, Pennsylvania and Vermont. The Midwest region: Illinois, Indiana, Iowa, Kansas, Michigan, Minnesota, Missouri, Nebraska, North Dakota, Ohio, South Dakota and Wisconsin. The South region: Alabama, Arkansas, Delaware, District of Columbia, Florida, Georgia, Kentucky, Louisiana, Maryland, Mississippi, North Carolina, Oklahoma/Indian Territory, South Carolina, Tennessee , Texas, Virginia and West Virginia. The West region: Arizona, Alaska, California, Colorado, Hawaii, Idaho, Montana, Nevada, New Mexico, Oregon, Utah, Washington and Wyoming. Non-metropolitan counties include those which are within micropolitan statistical areas and outside of the core-based statistical areas (CBSA).